Maduro just laughed off the new sanctions, telling Mnuchin to “sanction anybody you want,” that it won’t matter. Maduro’s people are calling U.S. sanctions a “badge of honor,” and Maduro himself is granting the targets raises and promotions following the imposition of them. The idea behind sanctions is punishment through freezing the U.S.-stored assets of Venezuelan officials and limiting travel and the ability to do business with Americans. Ultimately, goes the theory, sanctions, if they are severe enough, would cause discontent and divisions in Maduro’s administration, weakening it and setting the stage for a rebellion of some type. Some experts are expressing severe doubts that the sanctions are working and that, instead, they are hardening the attitudes of those being sanctioned. Much like Londoners when Hitler stepped up the bombing of their city in hopes it would soften them to accept terms of surrender, it further steeled them against the tyrant’s threat. The theory is that these sanctions will intimidate senior officials in the government, will help create divisions and will help nudge [Maduro’s government] towards some kind of transitional arrangement to resolve the crisis. But there is no sign they are succeeding in the way that the U.S. had hoped. This likely overstates the case, both for the United States and for Maduro. Estimates are that a complete shutoff of Venezuelan oil would cause the worldwide price of crude to rise by just $3.50 a barrel, or just a few cents per gallon of gasoline. Those refineries would very quickly replace Venezuelan heavy crude with increased imports from Canada, Mexico, and Colombia. And Maduro would likely find other customers to ship his crude to, including Cuba and China, which have long histories of supporting Marxist adventures in South America. Instead of ramping up sanctions, simple economics should be allowed to do the job of replacing Maduro. 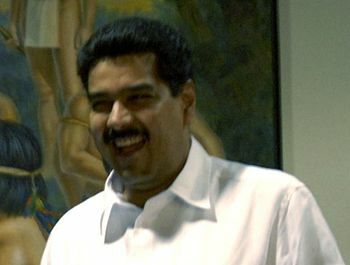 With his oil company PDVSA operating at about 30 percent of capacity and consequently generating revenues at a fraction of what they were just a couple of years ago, his government and his oil company are increasingly likely to default on large payments coming due before the end of the year. Maduro’s total outstanding government debt is estimated to be about $150 billion, and $5 billion of it, including principal and interest, are due and payable on or before December 31. With less than $10 billion in reserves — most of it in gold that isn’t easily converted into bolivars or dollars without collapsing the gold market — Maduro won’t come close to making those payments. His defaults will trigger foreclosure and seizure of major parts of his company’s operations, effectively moving control of it to outside interests and shutting off his primary source of revenue. These defaults would serve the same purposes as sanctions without the unconstitutional interference in Venezuela’s internal affairs, offensive as they are to so many. It’s less than six months to the end of the year and to the likely end of Maduro’s madness in his increasingly unhappy country. In this case, patience would indeed prove to be a virtue. This entry was posted	on Friday, August 11th, 2017 at 5:39 am	and is filed under Energy, Politics. You can follow any responses to this entry through the RSS 2.0 feed. You can leave a response, or trackback from your own site.